Entrepreneur Academy "Leadership in a Changing World"
Name: Entrepreneur Academy "Leadership in a Changing World"
Businesses must adapt to thrive in an ever-changing world. 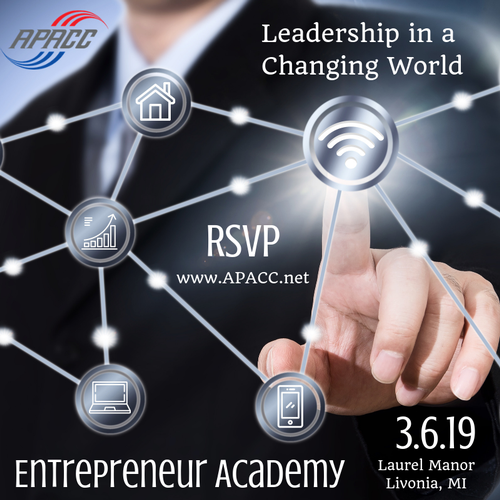 Come to the kickoff session of APACC's Entrepreneur Academy to learn how business leaders have overcome challenges and transformed their enterprises into stronger organizations. * Held during the East-West Business Connection! "IoT and Digital Transformation: Making the Connection and Capitalizing on the Opportunities"
"Leadership in a Changing World"
* Please be aware that all Entrepreneur Academy registrants are not allowed in the East West Business Connection "Meet the Buyers Session" nor have a copy of the East West Lexicon.